The Cedar Rapids Symphony performed its inaugural concert on April 13, 1921, in Coe College’s Sinclair Auditorium under the baton of Joseph Kitchen. By 1928 the Symphony was performing eight concert sets in Veteran’s Memorial Coliseum. General admission was 75 cents and season tickets were $5. It was unique among orchestras as it continued to perform during the years of the Great Depression and World War II, making it one of the oldest continuously operating symphonies west of the Mississippi River. In 1952 Henry Denecke, timpanist with the Minnesota Orchestra, was selected as Kitchen’s replacement to become the orchestra’s first salaried music director. Under his leadership the ensemble began to pay its musicians. In 1970 Richard Williams became music director, beginning a period of rapid expansion for the Symphony. The audience doubled, a string quartet was established, and new music was commissioned. By 1980 the Orchestra was performing eight pairs of concerts, along with a two-concert youth series, and had found a permanent home in the newly restored Paramount Theatre. Following a nationwide search, Christian Tiemeyer, then associate director of the Dallas Symphony, was named music director in 1981. Under his artistic leadership, the orchestra grew to be one of the largest in Iowa and established a significant economic presence in the community. A broad and diverse education program reached more than 600 students each year. 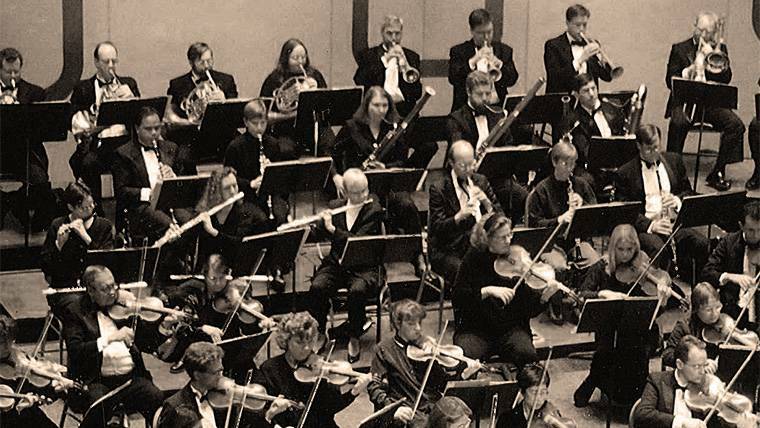 In 1990 the organization established an endowment fund, assuring the continued growth and financial stability of the Symphony into and beyond the 21st century. The school and administrative offices moved into the new Symphony Center (119 Third Avenue SE) in 2004. With modern music studios and the Rockwell Collins Recital Hall, Symphony Center offered students the finest facility for music study and performance in the area. In 2006, Timothy Hankewich, resident conductor of the Kansas City Symphony, was named Music Director. In 2008, Robert Massey joined the leadership team as CEO. On June 12, 2008, the Cedar Rapids Symphony’s school, administrative offices and performance home, the Paramount Theatre, were destroyed as the swollen Cedar River poured over its banks at 500-year flood levels. In addition to the two buildings, the Symphony lost musical instruments, production equipment and its entire office infrastructure. Despite the mass devastation, the Symphony rallied and began the post-flood reconstruction process operating under the new name, Orchestra Iowa. In spite of the many challenges associated with the historic disaster, Orchestra Iowa continued to uplift its community by providing programs and music that has earned it national attention. The Orchestra expanded its reach, becoming one of the leading regional orchestras in the country. In addition to increased public performances, the Orchestra brought symphonic music and music education programs to a broader audience through established partnerships with the nationally-syndicated “From the Top” radio program, Iowa Public Television and Iowa Public Radio. Orchestra Iowa also began permanent partnerships with the Cedar Rapids Opera Theatre and Ballet Quad Cities. The Orchestra actively led the charge to save the Paramount Theatre following the flood. Its tireless commitment spurred a $35 million restoration that was respectful to the Theatre’s historical integrity, while also outfitting the venue with state-of-the-art symphonic necessities. On November 3rd, 2012, following four years of recovery and renovation, Orchestra Iowa reopened the Paramount Theatre’s doors to a sold-out performance by Harry Connick, Jr., accompanied by the Orchestra. Since then, the Orchestra has continued to add to its rich history with monumental moments such as the commission, performance and recording of GRAMMY award-winning and Iowa native composer, Michael Daugherty’s American Gothic, the sold-out Resurrection concert which featured Mahler’s Symphony No. 2 and the return of the Paramount Theatre’s “Mighty Wurlitzer” organ. Orchestra Iowa is currently recognized as a one of the nation’s premier regional orchestras. It is a member of the Regional Orchestra Players Association and the League of American Orchestras, and serves as a model symphony, opera and ballet orchestra within the industry. It operates its own Opus Concert Café, which serves as a home to chamber music, jazz, cabaret and comedy, and is a co-operator of the Paramount Theatre. As a vibrant arts enterprise, it continues to connect Iowans through the world of music.